This page is to showcase my site design. You can click on the picture to see full size copies or click on the title to see more information about each site and link to the full site (if I still maintain it) from there. Feel free to comment or contact me in any way you like. This is a link to my personal site where I advertise my horse training work. I have made my living, mostly my entire life, through horse training. My web and photo work actually stemmed from the need to better advertise my horses. My first website, ever, was for my horse training and has simply blossomed into a lovely additional way to not only do what I love but talk about doing what I love. Since I love to talk about horses or anything else for that matter the web design just gives me more outlets. 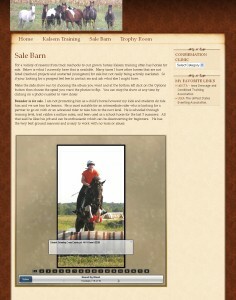 Please see my horse training site and keep in mind it’s ALWAYS a work in progress. It’s NEVER done, and most of the time its in limbo. I have a great slide show to advertise my horses in the SALE BARN. Check it out if your interested in presenting a lot of photos neatly its a good option. Click here to see the entire site Kalsem Training. 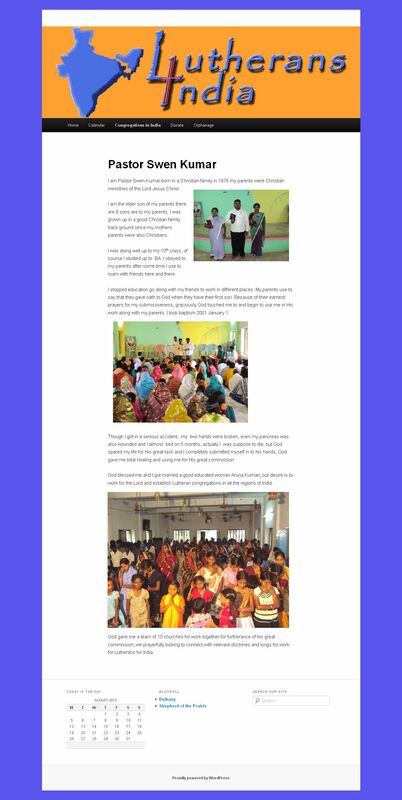 Lutherans 4 India is a website developed to allow the leaders of those congregations to share their stories, triumphs and struggles with all. Its an honor for me to work on this site for them although the communication is sometimes difficult the joy they share is great. This a simple site that has impacted my life greatly to see their story click below. This is a busy place! With changing monthly programs they advertise. A calendar where you can reserve your seat for any of the programs and a “shop” where you can purchase items, specifically Slater. Working with Bethany Lutheran Church has been a great experience for me. My family has had the opportunity to worship with them many times and the warm and welcoming atmosphere reminds me of home. My entire family loves going to celebrate Christ’s love with this congregation. Pastor Miller and the entire congregation invite all to visit and commune with them. Located in Kelly, Iowa they Worship every Sunday morning at 9:30 with Sunday School and fellowship afterword. The goal with this site is to simply give everyone a quick and easy way to share the information needed to manage the daily needs of the members and community. 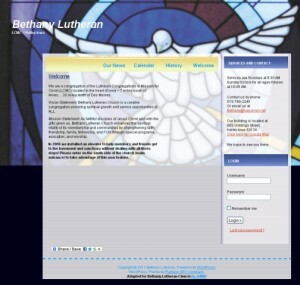 Please visit Bethany Lutheran Church. Central Iowa Bee Supply can provide any bee keeping needs in the area. These folks are bee keepers themselves and so they know what you need to be successful. They have a full inventory of medical supply’s and tools for bee keeping in addition, to their beautiful hand made hives. I had a very good time learning about bee keeping while getting this web site running. Sue is very strait forward and she can tell customers what she uses and why if there is a question with products. 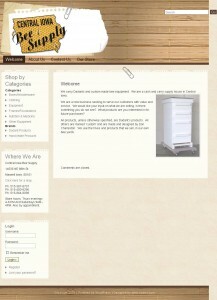 Check out their site for you bee needs and check out their sites attributes for you web needs. This is a site that utilizes a shopping cart! See their site in full click here Central Iowa Bee Supply. 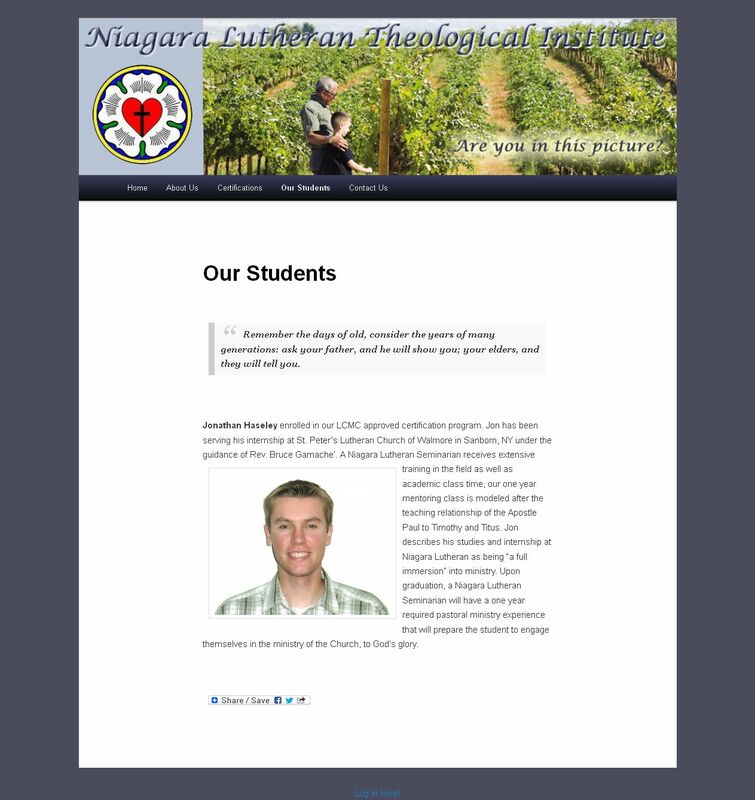 Niagara Lutheran Theological Institute. A site developed to be a gateway to the online classes that those seeking theological training will use. Student and instructor logins, on line communication systems that include live classes and prerecorded lectures. In addition to supporting files for any style of instruction the student needs or the instructor prefers to utilize. 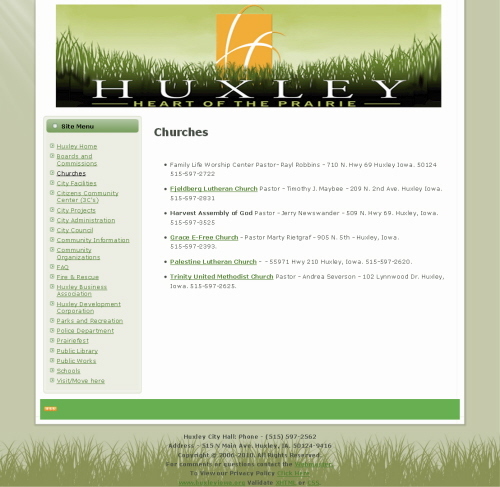 Huxley has a new Lutheran Congregation! I am blessed to be a part of it and very excited to see what the Lord has in store for all of us. A Bible based Lutheran body, Pastor Licht teaches from the scripture about Jesus Christ. 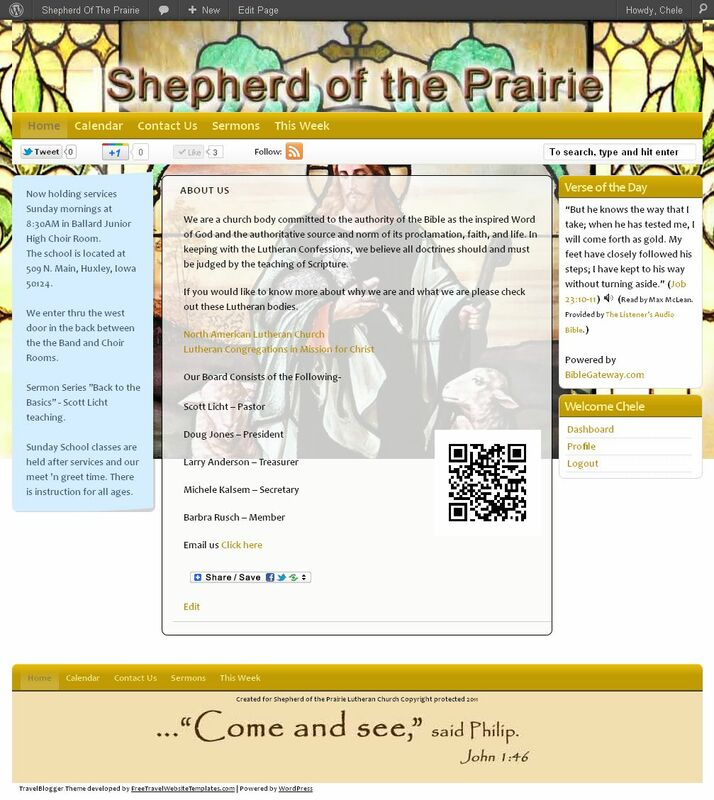 Click here Shepherd of the Prairie. 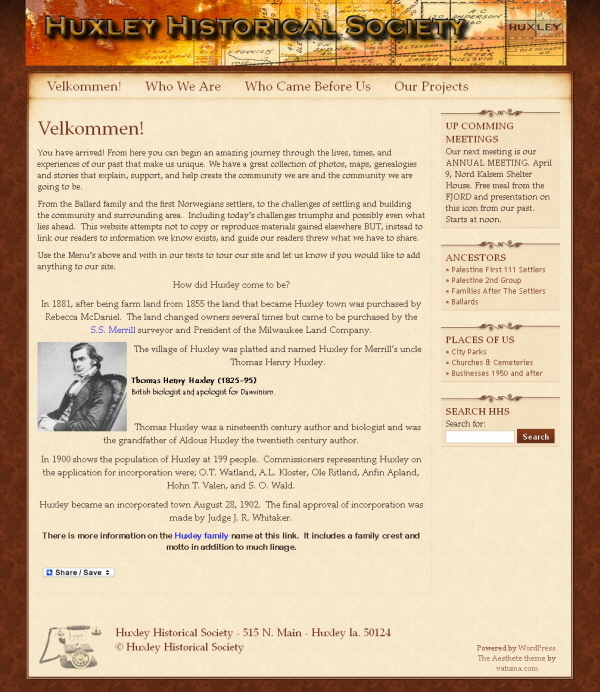 I volunteer as the web master of the Historical Society of Huxley and absolutely love it. Thick with Norwegian history we have genealogies of many of our town founders, historical photos of business, and memorabilia from years of love and relationships in our town. 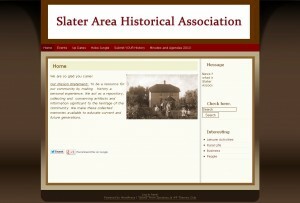 If you have an interest in Iowa History, or Genealogies of the area be sure and see this site. The Historical Society has GREAT news! They have secured a space to display items for public viewing. While it is not a museum they are excited to be able to show case what they can at this time. 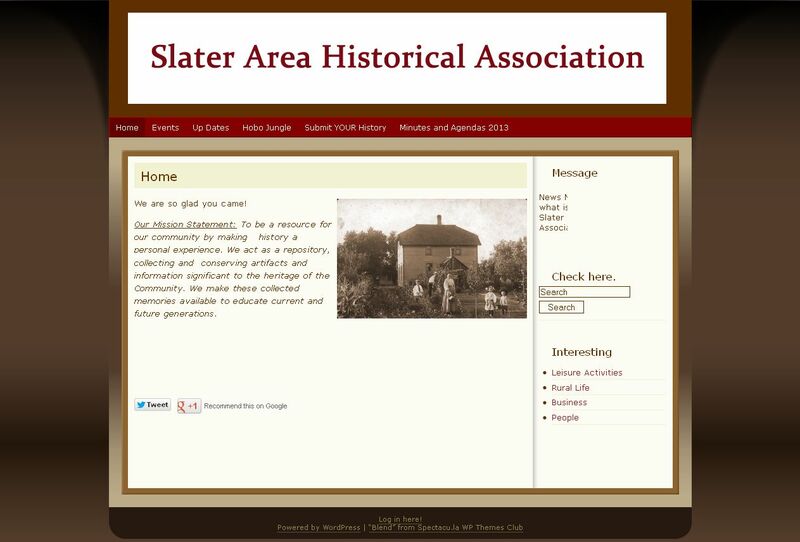 My job with the Historical Society is to publish as much information as I possibly can, about our community AND make it usable for education, historians and reference. 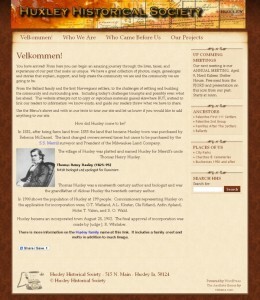 See this site at Huxley Historical Society. I love this header! We had some fun with it and I love these people too. This site has been discontinued but its still a design favorite. 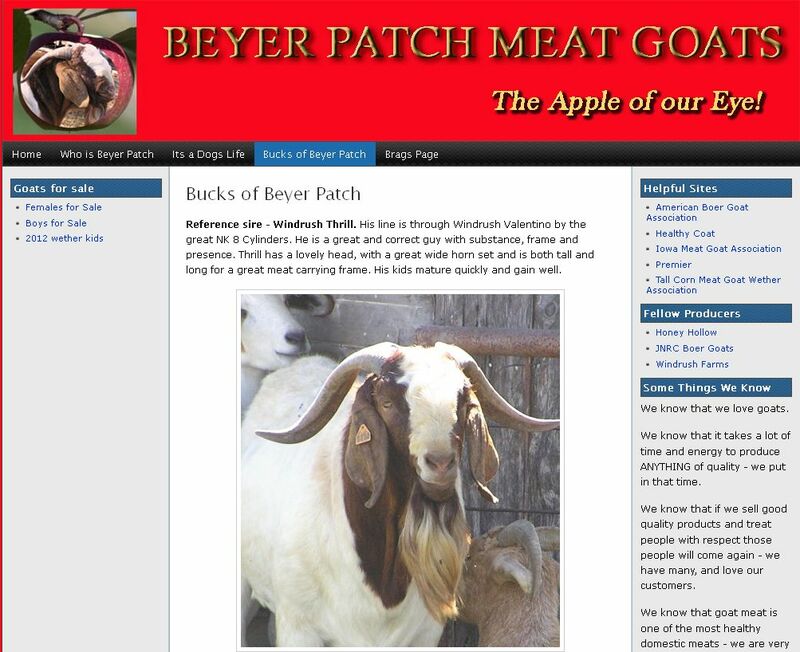 Beyer Patch Meat Goats happens to be my parents. Brought up on horses and charging into goats quiet by accident we all have embraced it fully. Raising Boer goats (and a few others) is definitely a family tradition with us now, as my children even have their own herds, handed down from my parents. Learn about Boer goats and buy your next show winner at Beyer Patch Goats. This is an other web site that shows how we can showcase livestock for sale. The links for websites link clients directly to feeds that send alerts if new animals become available. We can also link to production sales and social media sites like Facebook. For several years I worked with the City of Huxley and maintained their web site. The city administration and employees are number one in my book and am thankful of all the fine people I met while working with them. 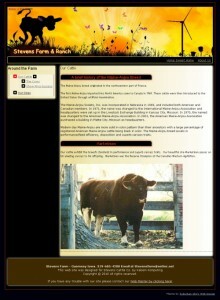 This is an example of the last theme that was developed for them by JHWP.